NewsRob now supports the built-in authentication mechanism for Android 2.1+ devices that have the Android Market. For now the old approach, the classic method, still works too. However when your Google Reader session expires, after 14 days, you will be asked to use the new method. Please do that unless you encounter any problems or you use an old Google Apps For Your Domain account. Google Apps For Your Domain accounts that have not yet been migrated to become proper Google accounts don't work with the new mechanism. You will not see any articles. When Google finishes the migration of all the old accounts the classic authentication mechanism will be turned off for Android 2.1+ devices. If you have any problems, let me know on the mailing list. At least in this release you can always logout and use the classic method. 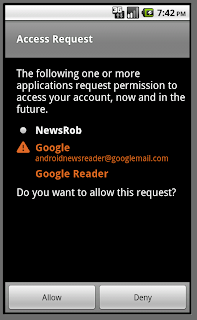 You can skip this part if you are not frequently switching between NewsRob and the Google Reader web app / other 3rd party apps. If you're not into details / techno mumbo jumbo you may also skip this section and hope that NewsRob does the right thing by default, which it probably does. Unfortunately Google dropped an API that NewsRob was relying on to sync efficiently. The effect is that state changes for articles that are already on your phone will not be synced. More specifically the removal of those states will not be synced. In particular this is about the read, starred, liked and shared state. Here is the essence: If you unstar an article after it is already available on your phone, the article on your phone will still keep the star. This may be a big issue for you, if your workflow relies on that, but for most users it probably isn't. There is a way for NewsRob to cope with that situation. Unfortunately it is less efficient in terms of computing time and bandwidth than it was before when the proper API was still in place. In the big scheme of things it is not a drama though. Downloading articles etc. still takes more time and bandwidth than the work around. I called the work around "Exact Syncing". It explicitly syncs each article's state with the server side. By default it only runs when you are on WiFi or the last exact sync is more than 24 hours ago. However if your workflow relies on the exact states of the articles at all times then you should turn on "Always Use Exact Syncing", which does exactly that. Besides a lot of small improvements and bug fixes NewsRob now also supports the ADWNotifier of ADWLauncher. Due to popular demand the action bar is now also available for devices with small screens. Unfortunately still not able to move the app to SD. Do you have plans to implement that? I haven't checked Gingerbread in detail, but so far it seems they didn't make it any better. I am undecided, but I tend to not enable it. I think I'd rather suffer from people complaining that NewsRob doesn't support that, then that many users will suffer from the consequences of enabling it. The marginal benefits outweight the drawbacks. As I said. Not a final decision yet. Will think it over for a bit longer. Also, would be nice to have tap-interface (when you just tap screen to left to see next article). Thanks again. kost BebiX, not sure I understand. If you tap on the screen hovering arrows appear and they will bring you to the next or previous article. You can even tap on the space where they will appear and the tap already counts, i.e. will trigger the next/previous article. A swipe gesture however is not possible, because the underlying WebView can also scroll horizontally if the content is wider than the screen. 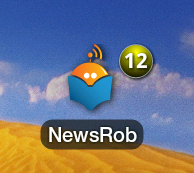 Thx again for update, newsrob (pro) is possibly my most used application! DISk. It's really hard to say. It depends on how many unread, starred, liked, shared articles you have. Looking at the log below (INNER is unzipped as it is processed, OUTTER is zipped as it is downloaded) we talk about 184KB for 10,000 unread. So in a worst case scenario where you have 10,000 unread, 10,000 liked, 10,000 shared, 10,000 starred. You would have 184 KB x 4 states x 24 syncs per day = ~17MB. The default would only sync it once a day on cellular, so it would be 0.7 MB per day in a worst case scenario. I would only turn it on, if you do frequently unstar an article after some time. If you don't turn it on, you will probably use less bandwidth than before, because for the read state I already did that, because GR does already do some optimization for mark-all-read on the server side, that prevented me from using the diff API already. Now I do that only during exact syncing. So on cellular this only happens once a day. There is more "space" and more combined knowledge available. "Timing: EntriesRetriever.getStreamIDsFromGR([user/-/state/com.google/starred]) took 5087 ms."
If you go back a couple of lines you'll see how much bandwidth it cost. Btw. regarding the times you'll see. You don't need to add them up. Those activities run at least partially in parallel. D/NEWSROB LOGGING( 969): <12 30 22:44> -------- [OUTTER] transferred: 188.652 KB in 16.177 seconds. D/NEWSROB LOGGING( 969): <12 30 22:44> -------- [INNER ] transferred: 1439.779 KB in 16.184 seconds. Its not syncing/showing all of my greader feeds. JRV, it does. However NewsRob only show you the feeds / labels for which you currently have articles on your phone. On the lite version when I 'Mark as Read' these articles then appear in the items read count where they don't in Google Reader. Is there a way of changing this? Does it happen in the Pro version? sorry, don't know what you mean. You mark something as read, you sync and then the articles are still marked as unread on the Google Reader web app, even after a refresh? Sorry didn't explain it well. When using Google Reader (desktop version) on the PC there is a section called 'Trends' under which it will tell you, amongst other things, how many posts you have read. When i 'mark as read' in Google Reader (desktop or mobile versions) these items don't count towards that count, whereas if i mark them as read in NewsRob they do count. You can also check this in Google Reader (desktop version) by going to the 'Recently Read' section which can be accessed from the Home page. Items that I have marked as read in Google Reader do not appear there but posts that I have marked as read in NewsRob do appear there. I accept it's not a concern for the vast majority of people but the OCD in me would like it. Ok, now I understand and that's bugging me too. Unfortunately I don't see that I can do anything about it. 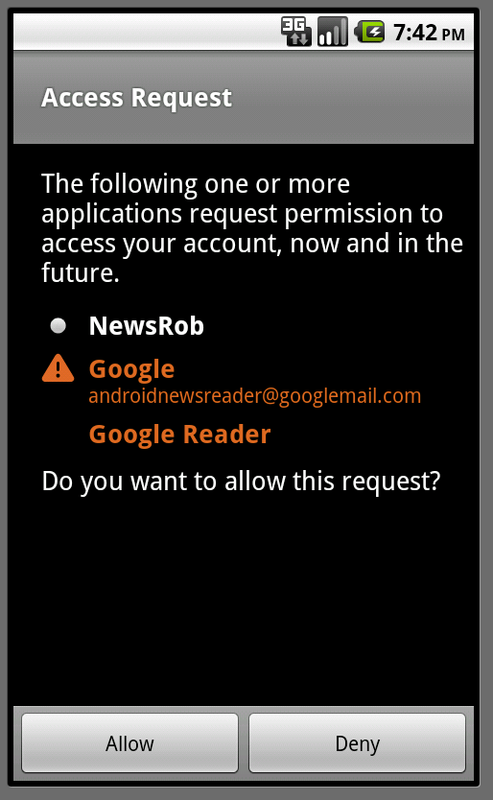 NewsRob and Google Reader work very differently with respect to Mark All Read. Help please!! For some reason my NewsRob on my HTC Hero says that it has synched as normal BUT it's not actually retrieving any new articles. When I go on Google Reader there are plenty of new articles that should be coming through. I have uninstalled and reinstalled the app but still nothing happening. Can you help please? The best thing would be if you could come to the list:http://bit.ly/nr_list. From the little you told me I would venture a guess, that you enabled "'newsrob' only syncing" in the settings. Or you set it to "WiFi only", but have no WiFi? Otherwise I need to know more or even get a log (how to create a log is described at the end of the http://bit.ly/nr_faq). If you come to the list I am sure we can figure this out!